Toraji Ishida is a bad high school kendo instructor with practically no money in his bank account. One day he is shooting the breeze with an old pal / former teammate of his, and they issue a challenge to each other. Since they both went on to become high school kendo instructors, why don’t they relive their days of competitive glory with their two teams going at it? If Toraji’s team wins, he gets a lifetime supply of sushi, which would be the perfect solution to his little financial crisis. There’s just one slight problem with the bet – Toraji’s team is so pathetic that there is only one active member still left on it! So he sets off to recruit a team of new freshmen to revitalize the club and win that precious all-you-can-eat sushi prize. Among his finds is Tamaki Kawazoe, a soft-spoken shy girl who is a phenomenal kendo player. Now with this star fighter on his team, does Toraji finally have a competent kendo lineup? 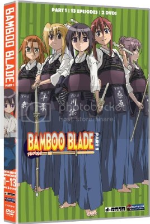 On the outside, Bamboo Blade looks like your typical moé fluff anime series, complete with a harem of highly characterize pretty girls, a weak female lead, and silly comedic antics. But if you actually take the time to watch it, you’d see that this is actually a wonderfully written series with some fine voice acting. Bamboo Blade is a slice-of-life high school story with a sports element thrown into it. It manages to perfectly pace itself between character development and kendo fighting. By the time the viewer has learned enough to care about a particular character, we get to see them in action during a kendo match. This becomes consistently entertaining through out these first 13 episodes, and I barely felt any boring or dull moments while watching them. While Bamboo Blade feels like it would resort itself to all the clichés of the “pretty girl” genre, it actually never comes close to any of them. All the characters somewhat fall into those familiar archetypes, but they add their own little spin to keep themselves fresh and interesting in the viewer’s mind. There’s hardly any sexuality involved, and any fan service involving the girls is kept to a subtle, almost teasing, minimum. In a mashup of moé and sports anime, Blade comes out with a truly original style. The voice acting is top-notch, and both the Japanese and the English cast give these characters a certain tone that will speak well to their particular audience. The Japanese voices are cartoony to keep this a light-hearted comedy. On the other hand, the English cast keeps their cool to keep their characters sounding more realistic, thus adding more impact to sporadic bits of silliness. Comedy doesn’t translate, so I really enjoyed seeing the English voice actors make it work so well. The one thing I found a little odd with the dub was the script adaptation. There was just too much Japanese terminology thrown in that it felt really awkward, especially since the dub has such a different tone from the Japanese. I understand the whole “senpai / sensei” hierarchy is very hard to translate to English, but do we really need to have something along the lines of, “we’ll have our very own kouhais!” in a dub? I would have much rather they used as little Japanese as possible, even if they had to take some liberties with the adaptation. The Good: Great story, great pacing, great characters, and great voice acting. The Bad: English adaptation struggles with Japanese cultural elements. Final Verdict: While Bamboo Blade may look like bishoujo-moé fluff on the outside, this is one solid, well-rounded, entertaining anime series. Watch it! This entry was posted on Monday, November 23rd, 2009 at 3:25 pm by Scott	.